(Francisco Kjolseth | The Salt Lake Tribune) Bhinda Singh, owner of Curry Pizza, a new restaurant in West Valley City, pulls out a freshly cooked pizza. Singh has combined Italy's classic meal with the flavors and spices of India. West Valley City • Indian pizza has landed in Utah. A few restaurants have started combining two cuisines that may seem foreign to marry, unless you remember that Italian and Indian dishes are both complemented by bread. The tikka masala and chicken curry pizzas have so far been novelties at other spots. 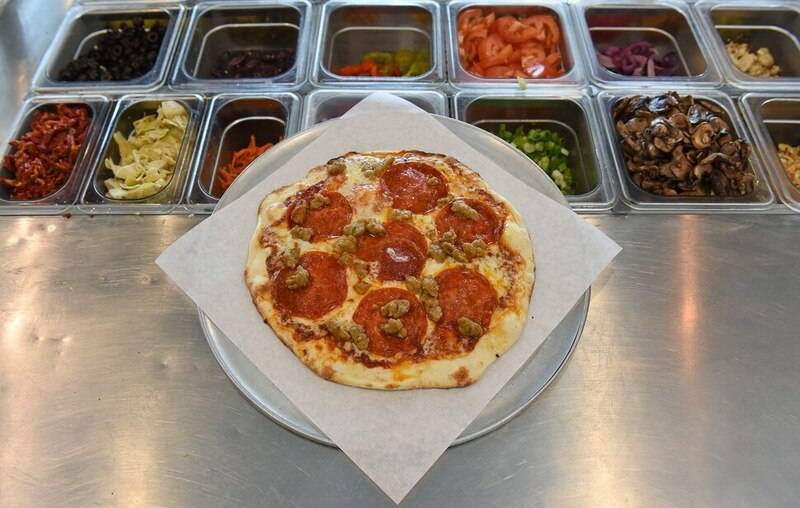 But they are the stars at Curry Pizza, which opened its first location in rural Bicknell last year and a second shop in a West Valley City shopping development off Interstate 80 and 5600 West in May. 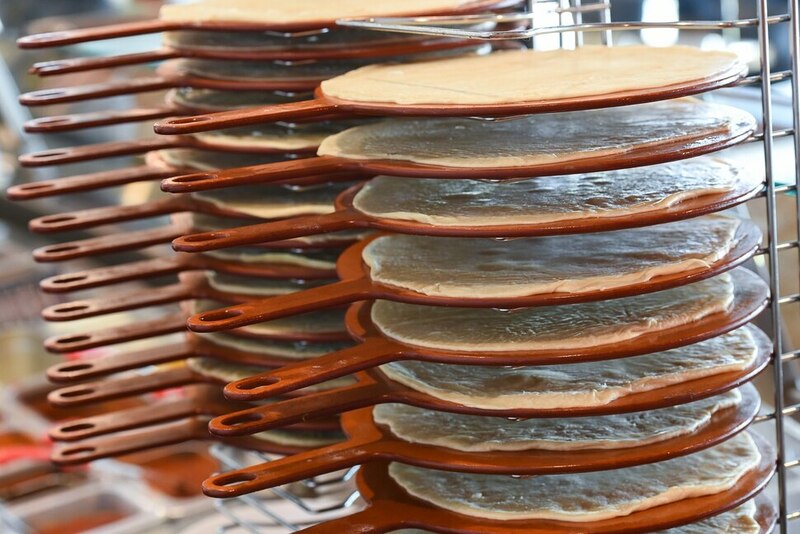 (Francisco Kjolseth | The Salt Lake Tribune) Personal sized pizza crust is stacked for quick preparation at Curry Pizza, a new restaurant in West Valley City that combines Italy's classic meal with the flavors and spices of India. (Francisco Kjolseth | The Salt Lake Tribune) The Honey Curry pizza with pepperoni, sausage and cheese on honey curry sauce is one of many specialty pizzas at Curry Pizza, a new restaurant in West Valley City that combines Italy's classic meal with the flavors and spices of India. (Francisco Kjolseth | The Salt Lake Tribune) Bhinda Singh, owner of Curry Pizza, a new restaurant in West Valley City pulls out a freshly cooked pizza from the open wood fired oven. Singh has combined Italy's classic meal with the flavors and spices of India and with his second Curry Pizza restaurant proving popular, he says he's considering opening up a third location soon. (Francisco Kjolseth | The Salt Lake Tribune) Curry Pizza, a new restaurant in West Valley City combines Italy's classic meal with the flavors and spices of India. One of several specialty pizza options is the Old World Mediterranean with old world sausage, spicy sausage, roasted mushrooms, roasted garlic, roasted onions, greek olives, basil, cheese on honey curry sauce. 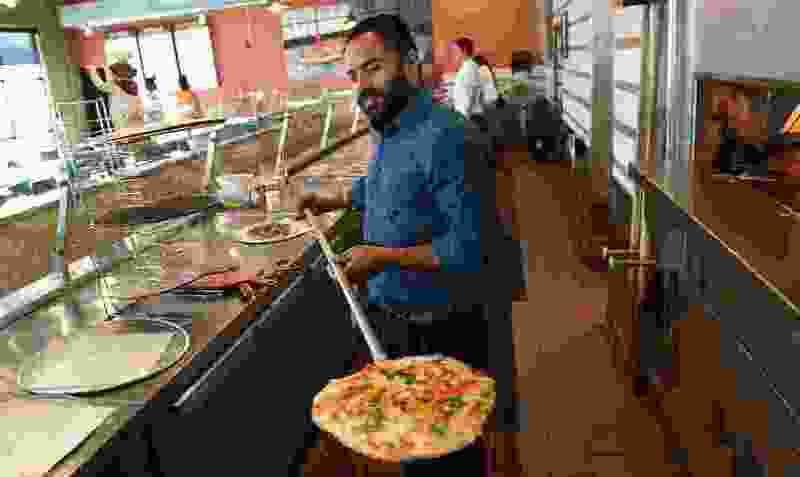 (Francisco Kjolseth | The Salt Lake Tribune) Bhinda Singh, owner of Curry Pizza, a new restaurant in West Valley City, fires up personal sized pizza as he combines Italy's classic meal with the flavors and spices of India. Singh's second Curry Pizza restaurant has proved popular and says he's considering opening up a third location soon. (Francisco Kjolseth | The Salt Lake Tribune) Warren Tharp prepares personal size pizza dough at Curry Pizza, a new restaurant in West Valley City that combines Italy's classic meal with the flavors and spices of India. Customers can choose traditional Italian ingredients or venture into a variety of Indian flavors. (Francisco Kjolseth | The Salt Lake Tribune) Mango and strawberry lassi at Curry Pizza, a new restaurant in West Valley City combines Italy's classic meal with the flavors and spices of India. (Francisco Kjolseth | The Salt Lake Tribune) Curry Pizza, a new restaurant in West Valley City combines Italy's classic meal with the flavors and spices of India as two curry pizza's made with chicken, mushrooms, green and red onions, jalapeo, cilantro and curry are cooked inside the open fire oven. (Francisco Kjolseth | The Salt Lake Tribune) Customers overlook the extensive topping menu at Curry Pizza, a new restaurant in West Valley City combines Italy's classic meal with the flavors and spices of India. (Francisco Kjolseth | The Salt Lake Tribune) Loveleen Kaur assembles a pizza for a customer at Curry Pizza, a new restaurant in West Valley City that combines Italy's classic meal with the flavors and spices of India. Customers can craft their own or try one of the Indian specialty pizzas. (Francisco Kjolseth | The Salt Lake Tribune) The Tikka Masala with chicken tikka or paneer, bell pepper, cilantro, tomato, greek onions, chilis, cheese and tikka masala curry is one of the specialty pizzas at Curry Pizza, a new restaurant in West Valley City that combines Italy's classic meal with the flavors and spices of India. (Francisco Kjolseth | The Salt Lake Tribune) Curry Pizza, a new restaurant in West Valley City combines Italy's classic meal with the flavors and spices of India. (Francisco Kjolseth | The Salt Lake Tribune) Brandon Rigby assembles a custom pizza at Curry Pizza, a new restaurant in West Valley City that combines Italy's classic meal with the flavors and spices of India. (Francisco Kjolseth | The Salt Lake Tribune) The Glazed Gyro with gyro meat, tomatoes, red onion, arugula, feta cheese, glazed balsamic vinaigrette, and cheese on honey curry at Curry Pizza, a new restaurant in West Valley City combines Italy's classic meal along with the flavors and spices of India. (Francisco Kjolseth | The Salt Lake Tribune) Curry Pizza, a new restaurant in West Valley City combines Italy's classic meal with the flavors and spices of India as customers pick their own toppings or choose from classic and specialty curry pizzas. A sign on the door assures customers they can find classic pizzas, made with marinara or pesto and plenty of pepperoni. But after trying the Mango Korma Pizza — made with chicken, large slices of Canadian bacon, green onions, mozzarella and a sweet mango sauce — you’ll be asking, marinara what? The concept for Curry Pizza started as a joke, says owner Bhinda Singh, whose family runs the successful India Palace in South Jordan and Provo. He bought a pizza place in Wayne County outside Capitol Reef National Park last year after he said he received terrible service and decided he could do better. He began serving traditional Indian dishes. As he explored how to excel at pies, a customer-turned-friend suggested he combine the two cuisines and promised that if he liked it, everyone would. The friend approved, and Singh converted another pizza spot in West Valley City. Curry Pizza is about crafting your own pie, with a giant menu board by the door that lists the 40 or so ingredients from which to choose, including the expected pepperoni, sausage, pineapple and black olives and surprises like chicken tikka, gyro meat, chorizo, paneer, avocado and peanuts. The pizzas are crafted and baked in a 500-degree pizza oven, flames visible, as you watch while standing in line. Personal-size pizzas, with six to seven slices, are $8.49. The 16-inch pies range from $14 for plain cheese to $21 for the specialty curry pizzas. The dining area is simple, with booths and tables made of smooth and glossy particle board. The restaurant wasn’t busy on our two visits. The drink menu is limited to soda, sparkling water and sweet and thick lassi drinks. The house-made base is naan-pizza crust, pulled thin but still thick enough to keep from getting soggy even after a couple of days in the fridge. Some of the sauces will be familiar to Indian food fans, including mango korma, tikka masala and makhani (butter chicken) curry. But they don’t taste like you’ve slathered your naan bread in Indian curry. Singh says he altered them from traditional dishes, thinning and strengthening them so that the flavor cuts through the cheese. The curry sauce and honey curry —both made with a tomato base and flavored with ginger, garlic and chile — were made for the pizzas. Go ahead and ask for a sample of the sauce; the employees happily oblige. The employees may have too light of a touch with some of the ingredients — the small chunks of chicken were negligible. But the pizzas are packed with flavorful herbs and vegetables. The Old World Mediterranean is a standout, made with with spicy sausage and roasted mushrooms, garlic and onions complemented by the honey curry. The first bite is sweet from the roasted onions, and it ends with the sauce’s heat. The Thai Peanut Chicken isn’t Indian but has a sweet peanut sauce that is addictive — and is a good choice for kids. It’s made with chicken, roasted bell peppers, carrot slivers and peanuts. If you like heat, ask for the owner’s special — which isn’t on the menu — made with roasted red onions, cauliflower, chicken, mozzarella, fresh basil, cilantro, ginger, garlic and fenugreek on the curry sauce. For now, the restaurant delivers only $100-plus orders. But it promises to expand soon. And with so many options to try, it can’t be soon enough. ★★ (out of ★★★★) The Indian owner has added his home cuisine to a pizza parlor, and the results are delicious. There’s marinara, too, but branch out and try honey curry sauce with your pepperoni. The ingredients and oven are on display and you can determine which of the 40 flavors end up on your pie as it’s being made. Hours • Mondays-Saturdays, 11 a.m.-10 p.m.